Bandai Hobby Gunpla presents Vegeta with the power of a Super Saiyan God Super Saiyan! Goku's most powerful rival and ally is shown with iconic blue hair that is molded via metallic gloss injection. The model has great poseability while still maintaining the sharpness of the sculpt an likeness of the character. 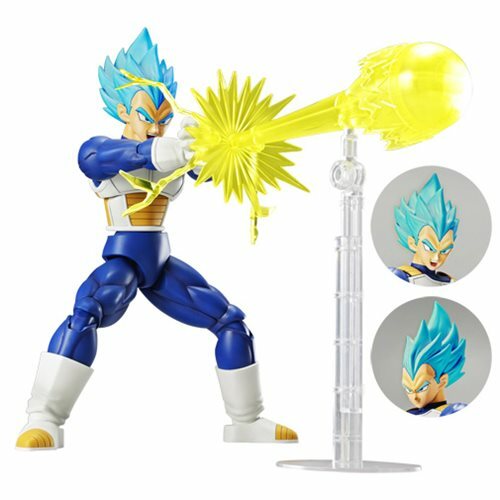 The Dragon Ball Super Super Saiyan God Super Saiyan Vegeta Figure-Rise Standard Model Kit includes 2x facial expressions, big bang and final flash effect parts, 6x hand parts for different expressions, and stand for the effect parts, 7x runners, stickers, and instruction manual. Measures about 6-inches tall. Ages 15 and up.